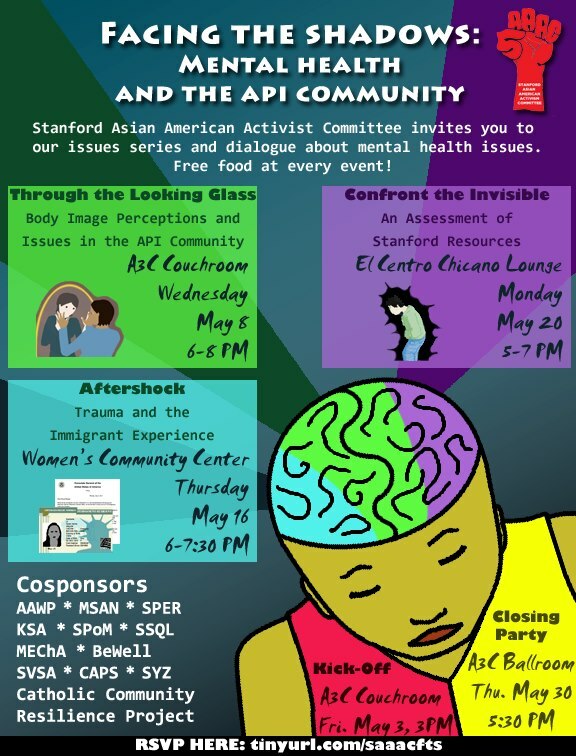 During May, API (Asian Pacific Islander) Heritage Month, the Stanford Asian American Activism Committee (SAAAC) will be hosting a month-long issues series on mental health in the API community context, titled Facing the Shadows: Mental Health and the API Community. The workshops are open to all interested students, regardless of ethnic background. Not only will we be covering specific issues within the realm of mental health, but also we hope to raise overall campus awareness of Stanford’s available resources and evaluate the effectiveness of those resources to accommodate minorities’ narratives and cultural differences. Each of these words alone holds no grand importance, but strung together in such a delicate order, they are the flags I proudly wave. This is the creed of Mark Mathabane, author of Kaffir Boy, a firsthand account of apartheid in South Africa. Understatedly, apartheid is a serious tragedy, and for me – a Rapunzel recently toppled from her ivory tower – to say I identify with the underdog … well, I mean no disrespect. I share my thoughts not to play oppression Olympics or to flash some badge of courage. I’m sharing, because the alternative is silence – and now is not the time for that.